(CNN) -- The parents of "Ashley," who underwent a controversial therapy to stop her from growing, agreed to speak exclusively to CNN about their daughter's health, the controversy the therapy has engendered among disability advocates, the suicide of the doctor who pioneered the procedure and the future of more children like Ashley. Ashley remains completely dependent, her parents say. She can't talk or walk and is fed through a tube. While her parents asked to remain anonymous to protect the family, they did answer CNN's questions about Ashley via e-mail. CNN: In photos from 2007, Ashley looks happy and engaged. What prompts her to smile? Ashley's parents: Ashley enjoys our company and our voices; when we sweet talk to her she often radiates with a big smile. She enjoys rich music, walks outdoors, a swim on a warm day, the swing, etc. She is also very fragile; a sneeze can set her crying inconsolably for more than an hour. CNN: You say Ashley is profoundly dependent on you. How so? Ashley's parents: Ashley is now and will always be dependent on us in every aspect of her life: On an hourly basis we give her a position change and prop her back on her pillow; we make sure she is well covered and pull her shirt down to cover her tummy; we wipe her drool, etc. Also there are diaper changes, tube feedings, dressing, bathing, teeth cleaning, stretching, entertainment, etc. Ashley's parents: Ashley's tolerance and ability to sleep at night have improved considerably. CNN: Does Ashley have interaction with children outside of your family -- does she have peers? Ashley's parents: Given Ashley's limited cognitive abilities, there's not much interaction. Ruling: Hospital broke law in "Ashley treatment"
Ethicist answers questions on "Ashley treament"
CNN: Has Ashley's outcome been what you expected? Ashley's parents: Thankfully, the "Ashley treatment" went smoothly, and it has been successful in every expected way. Her recovery from surgery was quick and uneventful, the scars are barely visible. There have been no side effects to the estrogen therapy. Ashley did not grow in height or weight in the last year, she will always be flat-chested, and she will never suffer any menstrual pain, cramps, or bleeding! CNN: What was your response to [Ashley's endocrinologist Dr. Daniel] Gunther's death last fall? People will inevitably ask, do you think your controversial case was a source of conflict or personal turmoil for Gunther? Ashley's parents: We were shocked and saddened for his loss and feel deeply sorry for his family. He was a kind, dedicated and principled person, whom we and many other families whom he helped have a lot of admiration for. We know from reliable sources that his treatment of our daughter was a source of energy and motivation for him. We also know from conversations with him that he was frustrated about being blocked from providing this treatment to other children in need. He empathized with parents and with their children and he strongly believed this treatment should be available to them. CNN: What do you consider Gunther's legacy to be? 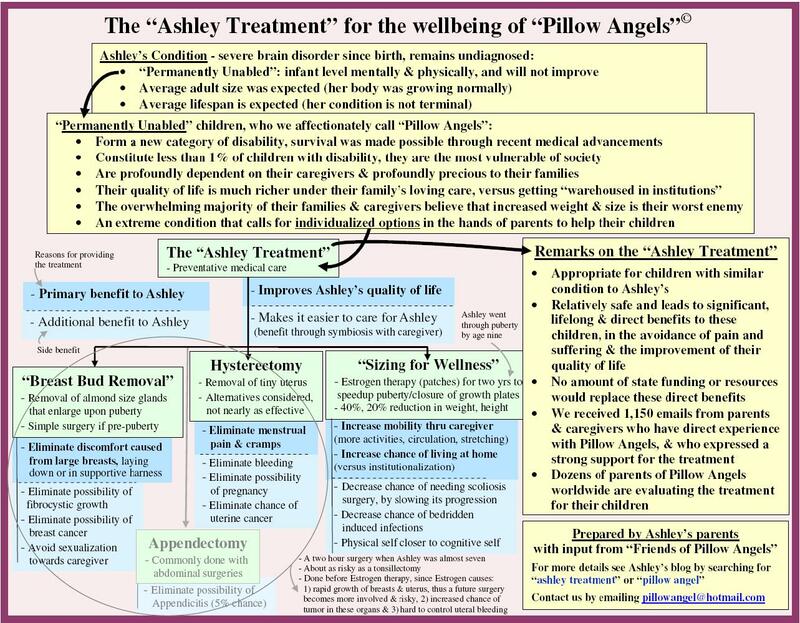 Ashley's parents: From e-mails we received, there are many "Ashleys" out there, who form a new category of disability that we affectionately call pillow angels (see our one slide summary). We estimate that under 1 percent of children with disabilities are in this category. Outside a small community of parents and caregivers who have the direct experience of caring for pillow angels, society does not know much about them and their special needs. Based on the hundreds of e-mails and testimonies we've received from this small community, it is abundantly obvious that increased weight and height are the worst enemy for pillow angels. Dr. Gunther's legacy is that he had the knowledge, compassion, confidence and courage to be the first to administer this estrogen therapy to a pillow angel, which sped up the natural closure of her growth plates and kept her small. Given the overwhelming supportive reaction that we have seen from parents and caregivers of pillow angels, we strongly believe that this therapy should be an option for the rare kids like Ashley, and Dr. Gunther has secured a place in history as its pioneer. CNN: Your advice to others contemplating this procedure for their profoundly disabled children? Ashley's parents: As parents we have a sacred duty to do what we believe is right for our children. If parents of children like Ashley believe that this treatment will improve their children's quality of life, then they should be diligent and tenacious in providing it for them. CNN: Do you consider yourselves a voice for any group? Do you consider yourselves foes of any group? No and no. We're simply passionate about sharing our experience and learned lessons with other families since we know it has potential to help many others like it helped our precious daughter. We feel that if our time and effort ended up helping a single pillow angel and her/his family, then it is worthwhile. CNN: You've had more than 2.5 million hits to your Web site, and have processed thousands of e-mails. Why do you think those people who came out so strongly against you did so? Ashley's parents: If you look closely at the evidence, critics might be loud but they are a minority opinion on this issue. From the e-mail we received, for every negative message there were 19 support messages (see full stats in our first anniversary update). Also, an MSNBC survey with more than 7,100 respondents shows 59 percent in support of the treatment. It seems that the treatment does not fit an ideology that has been developed by persons with disabilities and disability scholars. Even though this ideology might be serving the broader disability community quite well, it is clear to us that it was developed without considering the extreme case of pillow angels. Furthermore, a lot of the criticism came from people who themselves have disabilities and was based on their feeling about how inappropriate the treatment would be for them. Clearly Ashley is in a vastly different category of disability than someone who is able to blog and write e-mails and can make decisions for themselves. A chasm separates the two, not a slippery slope like some fear or claim. CNN: Do you think you changed any minds? Ashley's parents: More than 115 people e-mailed us explaining how their initial reaction was negative and changed to strong support upon better understanding. Their initial reaction was to sensationalist headlines and misleading reporting. They changed their minds once they visited Ashley's blog and saw a happy and well cared for child through her photos, and then read the factual story. Many of them apologized for judging us without seeking the facts first. CNN: Will you consider writing a book or doing a movie about Ashley? Ashley's parents: We are considering writing a book and/or telling our story in other ways, and we will do so only if we thought it would be helpful to other pillow angels and their families. CNN: How has having Ashley at the center of a highly publicized, controversial medical story affected Ashley's siblings? Ashley's parents: We've been successful at sheltering her younger sister and brother from this media frenzy. Thankfully the media and our community have been respectful of our family's privacy. CNN: Will you consider revealing your identity? Ashley's parents: At this point we feel that the blog and written interviews are a better approach, since we are dealing with complex and controversial issues that require carefulness and thoughtfulness. We will consider doing a quality interview only if we feel that it will make a material difference in helping other children and their families. CNN: One year after going public with Ashley's blog, was that the right thing to do? Ashley's parents: If we had our way, we would have chosen a more focused channel to convey our experience to medical professionals, caregivers and parents without looping the general public into the discussion; however, the story went public long before we published Ashley's blog, and at the time we posted it there were already several articles and dozens of blogs with all kinds of misinformed opinions without the benefit of many of the facts and details of the story. CNN: Your most important thought you'd like to convey? Ashley's parents: The Ashley treatment is relatively safe and has significant and lifelong benefits that can prevent serious pain and suffering and improves the quality of life for children like Ashley. The treatment was deemed appropriate and beneficial to Ashley by her parents, by her team of doctors, and by a multidisciplinary ethics committee in one of the best children's hospitals, a committee whose mission and sole purpose is to consider what was in Ashley's best interest. The treatment went smoothly and was successful in every way. More than 1,100 caregivers and family members with direct experience with pillow angels took the time to e-mail us with their support. Many included detailed testimonies (some are posted on Ashley's blog) of why this treatment brings significant and direct benefits to these children.